When beginning higher education studies in business and economics students bring with them diverse knowledge and experience in the field, which could affect their success in the program. Differences in prior economic education pose challenges to the teachers in higher education as they have to decide which knowledge of economics the students have. This is important for preparing the lessons in higher education. In this paper, we investigate how prior economic education influences beginning university students’ knowledge of economics. We administered items from the German adaptations of the test of economic literacy and the test of understanding college economics, both developed by the national council on economic education, to assess the general knowledge of economics and specific knowledge of micro- and macroeconomics of 511 beginning students at two universities in Germany. Participants who had completed vocational training or a course in economics as a major subject at secondary school (“Leistungskurs Wirtschaft”) performed significantly better on items relating to general economics and macroeconomics; however, there was no significant difference in performance on items relating to microeconomics between the comparison groups. Attendance of an upper secondary school specializing in economics (“Wirtschaftsgymnasium”) has no significant effect when controlling for these two learning opportunities and other personal characteristics. In addition, we performed regression-analytic modelling to examine the correlation between economic knowledge and personal factors such as gender, grade on university entrance examination, and migration background and found effects depended on the economic content area assessed. The study demonstrates that there is a heterogeneity in students’ knowledge of economics when beginning higher education studies in business and economics. The results of this research highlight the importance of designing target-oriented teaching methods that take into consideration the study-relevant (prior) knowledge of beginning students. Beginning students of business and economics differ in the education they obtained before starting their university programs in economics: While some have completed vocational training,1 others have completed courses in economics as a major subject at secondary school (Bouley et al. 2015; Brückner et al. 2015b; Hillmert and Jacob 2003). Similarly, it is possible for the upper classes of secondary school (typically school years 11–13 or 11–12), students attended an upper secondary school specializing in economics (“Wirtschaftsgymnasium”) rather than a standard upper secondary school (“allgemeinbildendes Gymnasium”) (Chang 2005; Georg 2014). In their internationally established model of study success, Kuh et al. (2007) show the correlation between learning opportunities taken prior to beginning studies and beginning students’ knowledge upon starting their studies. Although investigation has been made into the impact of having completed vocational training (Beck and Krumm 1994; Brückner et al. 2015b; Happ et al. 2016b; Van den Berg and Hofman 2005), a course in economics as a major subject at secondary school (Brasfield et al. 1993; Gill and Gratton-Lavoie 2011; Shim et al. 2009; Walstad et al. 2007) or attendance of an upper secondary school specializing in economics (Sczesny and Lüdecke-Plümer 1998) on knowledge of economics, these student-related variables generally have been examined in isolation of each other. From a learning-theoretical perspective, it could be assumed that students use their prior knowledge of economics to create a mental representation of economics-related problems. The more formal education in economics students have obtained prior to starting their university studies in economics, the greater their knowledge of economics is when they begin their studies. In this paper investigation is made into the extent to which prior education in economics accounts for study-relevant knowledge upon beginning university studies. Further, investigation is made into whether the (test-based) assessed level of knowledge of economics differs systematically between beginning students of business and economics that have had such prior educational experiences (i.e., completed vocational training and/or a course in economics as a major subject at secondary school and/or attendance of an upper secondary school specializing in economics) and beginning students that have not (for a model of knowledge of business and economics, see Zlatkin-Troitschanskaia et al. 2014). The results of this research will provide important insight for designing target-oriented teaching methods that take into consideration the study-relevant knowledge of beginning students (cf. contributions in Hoyt and McGoldrick 2012). To determine exactly how prior economic knowledge differs among beginning students, a measurement instrument needs to include items that accurately assess general knowledge of economics at a basic level and items that assess more specific knowledge of economics at an in-depth level (Dochy et al. 1999; Hailikari 2009; Yousfi and Böhme 2012). In this study, for the first time, items from two measurement instruments—the German adaptation of the fourth version of the American test of economic literacy (TEL4-G, see Happ et al. 2016a; for the original American version, see Walstad et al. 2013) and the German adaptation of the fourth version of the American test of understanding college economics (TUCE4-G, see Zlatkin-Troitschanskaia et al. 2016; for the original American version, see Walstad and Rebeck 2008)—are used to assess the knowledge of economics of beginning university students enrolled in business and economics programs at two universities in Germany. Combining items from these two instruments allows knowledge of the main content areas of economics (i.e., basics of economics, microeconomics, and macroeconomics; for a nationwide curricular analysis of the content areas, see Zlatkin-Troitschanskaia et al. 2016) and knowledge at various levels to be assessed separately. As a result, the effects of the three learning opportunities (vocational training and/or a course in economics as a major subject at secondary school and/or attendance of an upper secondary school specializing in economics) can be analyzed according to content area. First, the theoretical basis of this study is explained (“Theoretical basis and hypotheses” section). Second, the selection and setup of two test instruments used in the operationalization of economic knowledge and the sample are described (“Test instrument and sample” section). Third, through the calculation of t tests and multiple linear regression models, the impact of having completed vocational training and/or a course in economics as a major subject at secondary school and/or attendance of an upper secondary school specializing in economics on economic knowledge prior to beginning higher education studies in economics is assessed (“Results” section). Lastly, the findings and limitations of the study are discussed and conclusions for further research are provided (“Discussion” and “Conclusions” sections). According to the results of the Germany-wide analyses of higher education economics curricula conducted by Zlatkin-Troitschanskaia et al. (2015) and current higher education economics textbooks conducted by Happ et al. (2016b), economic knowledge comprises the main content areas of general economic knowledge, microeconomic knowledge, and macroeconomic knowledge. This classification is based on the established curriculum and the structure presented in current economics textbooks (e.g., Krugman and Wells 2013; Mankiw and Taylor 2011; Samuelson and Nordhaus 2010). General economic knowledge consists of basic economic concepts such as the principles of scarcity and opportunity costs and can be distinguished from more specific microeconomic and macroeconomic knowledge (OECD 2011). Therefore, a test instrument that serves to operationalize knowledge of economics needs to assess these three main content areas of economics (for a model of knowledge of economics, see Zlatkin-Troitschanskaia et al. 2014). In several studies differences in the knowledge of economics of beginning students have been found to be rooted in learning opportunities taken before starting university studies (e.g., Happ et al. 2016b). The curricula of vocational training programs in commercial administration, for example, for apprentices in industrial management assistance and banking, and relevant textbooks address economics-related topics (e.g., Hartmann 2015, for industrial management assistant; Möhlmeier et al. 2015, for bank business management assistant). If beginning students have completed commercial-administrative vocational training before starting their university studies, they can be expected to have greater knowledge and understanding of economics than those who have not had such training (hypothesis 1). Not only apprentices in commercial-administrative vocational training programs but also senior students at secondary schools who have completed an economics course as a major subject in secondary school learn about economics-related topics. For example, in the state of Hesse topics such as economic production factors and the macro-economic process, the economic principle and determinants of economic growth are addressed in the curricula of a major economics course. Furthermore, the textbooks used in this schooling context also indicate that fundamental economic contents are already conveyed at this stage (e.g., Lorz and Siebert 2007; for exemplary textbook recommendations by the state of Rhineland-Palatinate see Pedagogical State Institute Rhineland-Palatinate 2018). Thus, it can be assumed that graduates who have completed a course in economics as a major subject have greater knowledge and understanding of economics than students who have not completed a course in economics as a major subject (hypothesis 2). In Germany the degree of specialization of the different school types varies by state (Eckhardt and Eurydice 2017). In Rhineland-Palatinate and Hesse, which are the German states the empirical part of this paper focuses on, higher education entrance qualification can be obtained at a specialized upper secondary school as well as at standard secondary school. As the present paper focuses on economic knowledge, upper secondary schools specializing in economics are of particular interest.2 In view of the textbooks recommended for vocational schools, clear differences can be seen in comparison to the textbooks recommended for non-specialized schools. This is the case in Hesse, for example (for standard school textbook recommendations, see Hessian Ministry for Education and Cultural Affairs 2017b; for vocational school textbook recommendations, see Hessian Ministry for Education and Cultural Affairs 2017a). When contrasting school textbook recommendations for the vocational school sector (for Rhineland-Palatinate, see, e.g., Distel et al. 2014; Lüpertz 2018) with the textbook recommendations for the non-specialized school sector (for Rhineland-Palatinate, see, e.g., Bauer et al. 2016; Engelhart 2010), certain differences become apparent. The recommendations for the vocational school sector include far more textbooks on economic topics, while the economics-specific textbooks recommended for the non-specialized sector tend to address rather political topics and tend to focus less on business and economics (Hessian Ministry for Education and Cultural Affairs 2017b, p. 20). With regard to curricula, upper secondary schools specializing in economics present a stronger focus on economic contents. It can therefore be assumed that the economic knowledge of students who attended an upper secondary school specializing in economics differs from that of standard upper secondary school students (hypothesis 3). Previous research has already highlighted differences between beginning students from standard and economics-oriented upper secondary schools, indicating that the two school types attract different types of school graduates. Trautwein et al. (2007) point out, that students of standard upper secondary schools show a higher level of general basic cognitive abilities than students from upper secondary schools specializing in economics. Many studies have identified basic cognitive abilities as particularly relevant for knowledge acquisition in general (e.g., Prins et al. 2006) as well as for the acquisition of economic knowledge in particular (e.g., Happ et al. 2016b). Therefore, the effects of general cognitive abilities on economic knowledge are controlled for in both groups of students. In analyses of the impact of having completed commercial-administrative vocational training and/or a course in economics as a major subject at secondary school and/or attendance of an upper secondary school specializing in economics on knowledge of economics, various other person-related variables of the participants such as gender need to be examined in regression modelling to avoid bias in estimations (Parker 2006). Hence, results of many surveys indicate that male participants have an advantage on standardized tests of knowledge of economics (e.g., Asarta et al. 2014; Brückner et al. 2015b; Förster et al. 2015b; Gill and Gratton-Lavoie 2011; Happ et al. 2016a; Walstad and Rebeck 2008), which is why gender should be considered in the modelling. Hurrelmann (2009) found that secondary school students in Germany with a migration background had a lower level of knowledge of economics than students with no migration background. Moreover, Brückner et al. (2015a) and Happ et al. (2016a) found students in Germany whose mother tongue was not German had a lower level of knowledge of economics. Consequently, it can be assumed that the participants’ levels of economic knowledge differ according to whether or not they have a migration background, which is why this person-related variable also should be investigated. A student’s grade upon leaving school is of paramount importance as it is the most common criterion for admission to universities in Germany (see Uthmann 2009). This is linked to the expectation that a student’s final grade correlates with his or her intellectual abilities. In several studies a correlation has been found between secondary school GPA and students’ knowledge of economics (see, e.g., Anderson et al. 1994; Walstad et al. 2013). Hence, participants’ final grades should be taken into account. Due to the different economic learning opportunities before the beginning of studies, a high heterogeneity in economic knowledge among participants is to be expected. Therefore, items of varying difficulty levels from several instruments were purposely selected, also considering content differentiation (see “Economic knowledge and understanding”). The items for operationalizing knowledge of economics in this study come from two validated test instruments that were adapted into German. To determine participants’ (1) general knowledge of economics, items from the fourth (German) version of the American test of economic literacy (TEL4-G) were used. The original TEL4 was constructed with two parallel versions A and B, each consisting of 45 items (Walstad et al. 2013). Approximately 40 min is needed to complete each version. The two versions are linked via 10 anchor items. The items from the TEL4 were translated into German and adapted to suit the German context (for the adaptation process, see Förster et al. 2015a). In this study, 10 items relating to the basic system of economics were selected from the TEL4-G to assess students’ general knowledge of economics. These ten items cover basic principles such as scarcity and the principle of opportunity costs. Both test version A and B of the TEL4-G were used in a study conducted in Germany in the summer semester of 2014 with a total of 1397 economics students. The short version of the TEL4-G used for the present paper shows a Pearson correlation of .85 (p = .000) with the full scale of version A and .84 (p = .000) with version B. Therefore, the correlation between the total score of the TEL4-G and the short is high, which means that the ten selected items are representative of the information in the full test. The items’ reliability is acceptable, with a Cronbach’s alpha of .62 for ten dichotomous items (Happ et al. 2017). To assess beginning students’ knowledge of (2) microeconomics and (3) macroeconomics, items from the fourth (German) version of the American test of understanding college economics (TUCE4-G) were used. The original TUCE consists of two parts: microeconomics and macroeconomics (Walstad and Rebeck 2008). Each part has 30 multiple-choice items and takes approximately 30 min to complete. The TUCE was translated into German and adapted to suit the German context for use in the WiWiKom I project (Zlatkin-Troitschanskaia et al. 2014). Due to test time restrictions and expectable fatigue effects during test-taking it was not possible to let every participant complete both versions of the TUCE4-G in addition to the ten items from the TEL4-G. Therefore, this study resorted to a test booklet design, for which two versions of a questionnaire were constructed.4 While both versions had 10 items from the TEL4-G concerning general knowledge of economics, one version had all 30 items from the TUCE4-G concerning microeconomics and the other version had all 30 items concerning macroeconomics. Hence, each instrument to assess participants’ knowledge of economics consisted of 40 items. The order of the items was different in each of the two versions of the questionnaire to avoid position effects. This means that in one version of the questionnaire the participants were presented with items 1–40 and in the other with items 40–1. On the personal data part of the questionnaire, participants first reported on whether they had completed commercial-administrative vocational training and/or a course in economics as a major subject at secondary school and/or attendance of an upper secondary school specializing in economics. Then, they reported on their gender, final grade, and migration background. To determine possible migration background, participants were asked about their parents’ place of birth and the language used at home. These two indicators have formed the basis for the operationalization of migration background in numerous studies in education (Klein et al. 2014; Kristen et al. 2008; Salentin 2014; Sugarman et al. 2016). As can be seen in Table 1, 20.5% of the participants had completed vocational training, more than a third (35.2%) of participants had completed a course in economics as a major subject at secondary school and 29.7% attended an upper secondary school specializing in economics. 5.7% (N = 29) of participants had completed both vocational training and a course in economics as a major subject at secondary school. The overlap between participants who attended an upper secondary school specializing in economics and those who completed a vocational training or an economics course as a major subject is remarkably high. 46.7% (N = 49) of participants who completed a vocational training had previously attended an economics-oriented upper secondary school and 49.2% (N = 88) of participants who had economics as a major course had also attended a specialized upper secondary school. The distribution of person-related variables (gender, final grade, migration background) complied with the usual distribution among beginning business and economics students (Federal Statistical Office 2016). Therefore, no systematic distortions can be assumed in the sample (for limitations, see “Discussion” section). As can be seen in Table 2, there was only a slight difference in completion of vocational training between the genders. Gender differences were significantly larger among participants who had completed a course in economics as a major subject at secondary school as well as among those who had attended of an upper secondary school specializing in economics. The percentage of male participants who had attended a specialized upper secondary school or completed a major economics course is higher than the respective percentage of female participants. Far fewer participants with a migration background (13.5%) had completed vocational training in comparison to participants with no migration background (23.5%). The number of students with a migration background and the number of students without a migration background who had completed a course in economics as a major subject at secondary school was about the same. However, this is not the case with attendance of an upper secondary school specialized in economics. Participants with a migration background (38.7%) attended this school type far more often than participants without a migration background (26.1%). Participants from specialized upper secondary schools only had a marginally worse final grade (mean = 2.47) than participants from standard upper secondary schools (mean = 2.37). These descriptive findings (Table 2) highlight the importance of controlling for personal characteristics such as migration background or gender in further analyses. Analyses of participants’ scores on the 10 items from the TEL4-G concerning basics of economics, the 30 items from the TUCE4-G concerning microeconomics, and the 30 items from the TUCE4-G concerning macroeconomics were analyzed separately. 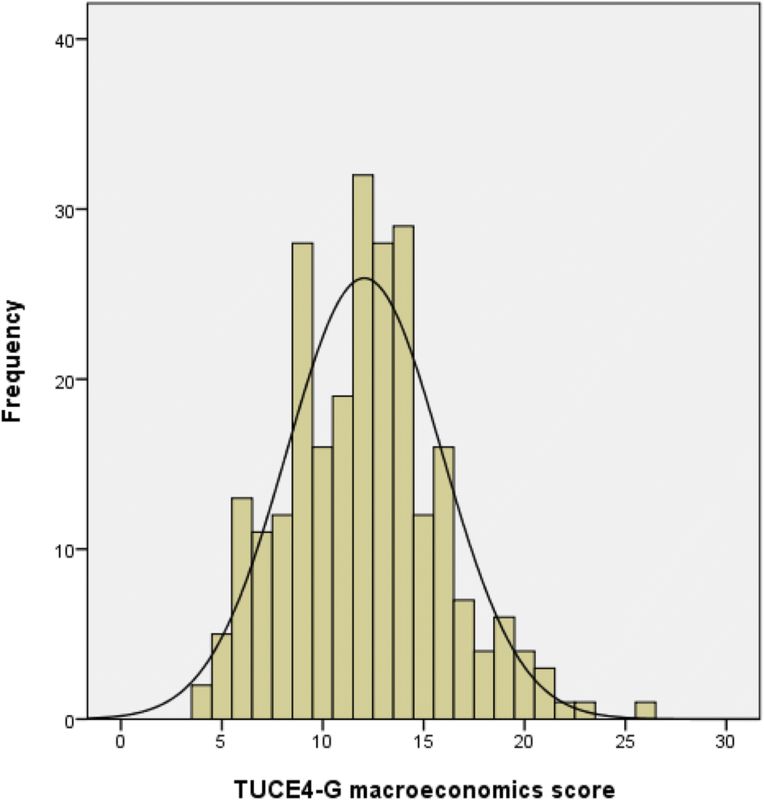 The distribution of the three scores in the sample was examined using a histogram. First, the number of missing values in the performance data was considered. The respondents with more than 50% in missing values, that is, unanswered items in one of the three content areas, were excluded from analyses. Accordingly, seven participants were excluded from further analyses for the TEL4-G items, four were excluded from analyses of the TUCE4-G microeconomics items, and one was excluded from analyses of the TUCE4-G macroeconomics items. On average, the 504 beginning students obtained 6.6 of a maximum of 10 points on the TEL4-G items (SD: 1.831). This means that, on average, they responded to more than half of the items relating to general knowledge of economics correctly. Results of the Kolmogorov–Smirnov test (p = .000) and the Shapiro–Wilk test (p = .000) indicate that the assumption that distribution was normal must be rejected (see Fig. 1). 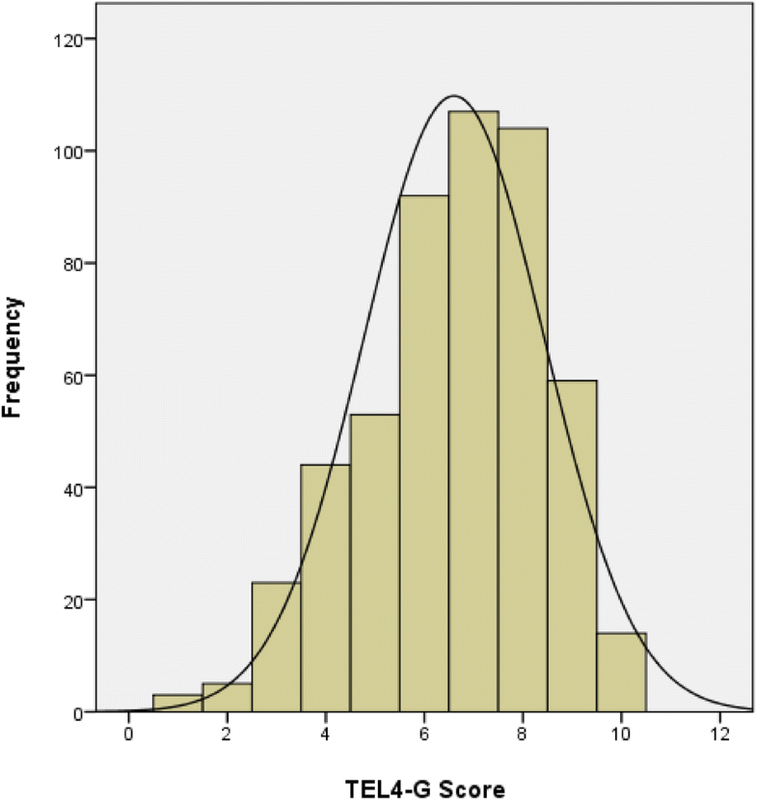 However, with regard to skewness (− .470) and kurtosis (− .217), the deviations of the curve from the normal distribution were not considered to be great. Accordingly, the distribution can be characterized as being fairly normal (Chou and Bentler 1995; Curran et al. 1996; Gravetter and Wallnau 2014; Ho and Yu 2015). The histogram (see Fig. 2) for the score on the macroeconomics part of the TUCE4-G indicates that the 250 participants responded correctly to an average of 12.06 of the 30 items (SD: 3.844). As expected, the TUCE4-G items concerning macroeconomics were more difficult for the participants than the TEL4-G items. Overall, participants were only able to successfully solve fewer than half the items in this test. It should be noted, however, that some participants were able to score more than 25 points in this test (see Fig. 2). Results of the Kolmogorov–Smirnov test (p = .000) and the Shapiro–Wilk test (p = .001) indicate that the distribution of the scores on the TUCE4-G items concerning macroeconomics was not normal. However, when skewness (.392) and kurtosis (.297) were taken into consideration, the scores on the TUCE4-G items concerning macroeconomics had a fairly normal distribution. When examining the distribution of the scores on the 30 TUCE4-G items concerning microeconomics, it is noticeable that with an average of 9.43 points (SD: 2.823) this part of the test was the most difficult for the 256 beginning students. On average, participants solved less than a third of the items correctly. Therefore, the test part of TUCE4-G concerning microeconomics is even more difficult for the participants than the TUCE4-G macroeconomics test. On this test, no participant was able to solve more than two-thirds of the test items correctly. Results of the Kolmogorov–Smirnov test (p = .000) and the Shapiro–Wilk test (p = .002) indicate that the distribution of the scores on the microeconomics part of the test was not normal. However, the distribution can be considered as relatively normal when examining the skewness (.284) and kurtosis (.340) (see Fig. 3). To investigate the main question in this study (see “Problem” section “To what extent does prior education in economics account for study-relevant knowledge upon beginning university studies?”), t tests for each of the three scores for independent samples were conducted (see Elliott and Woodward 2007; Moore and McCabe 2003). Results for the participants who had had no vocational training were compared to those for the participants who had. Also, results for the participants who had completed a course in economics as a major subject at secondary school were compared to the results for participants who had not. Similarly, students from economics-oriented upper secondary schools were compared to students from standard upper secondary schools. 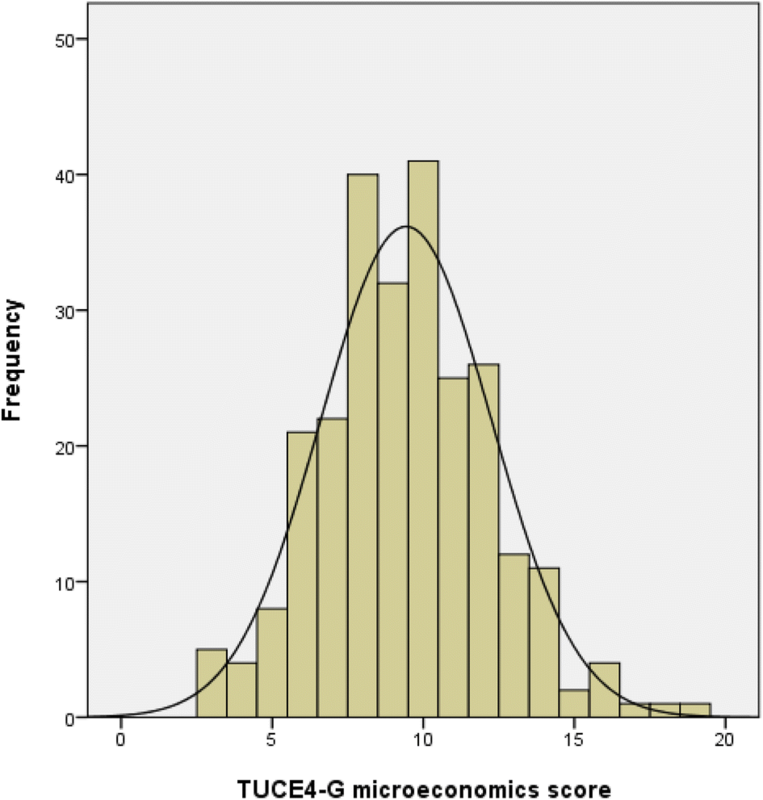 The effect size of Cohen’s d6 was calculated in order to measure the strength of the relationship. The results of the t-tests are shown in Table 3. Results of the t-tests reveal highly significant differences in the mean values of the scores on the TEL4-G items concerning basics of economics between students with and students without vocational training and students with and without a course in economics as a major subject. The effect size of having completed vocational training (Cohen’s d = .41) and a course in economics as a major subject (Cohen’s d = .308) was small. A significant gap in knowledge of macroeconomics, as indicated in responses to items from the TUCE4-G, also was found between students with and students without the two learning opportunities. Cohen’s d of .352 for vocational training completed and .48 for completing a course in economics as a major subject at secondary school indicate a small to medium effect size. The beginning students who had completed vocational training or a course in economics as a major subject at secondary school achieved higher scores on the TUCE4-G items concerning microeconomics than beginning students who had had neither of the two learning opportunities. However, the findings are not significant, and the values of the effect size are very low (Cohen’s d vocational training = .231; economics course = .117). Findings in regard to the attendance of an upper secondary school specializing in economics demonstrate: Neither the TEL4-G nor the TUCE4-G test scores show significant or, in view of the effect size Cohen’s d, meaningful differences between students from the two school types (Table 3). As results of the analyses above indicate (see Table 2 in “Sample” section), differences in the relationship between person-related variables (i.e., gender, migration background and final grade) and performance on the 40 questionnaire items depended on the previous educational experiences (vocational training and/or a course in economics as a major subject at secondary school). To analyze this distribution, multiple linear regression were calculated in which learning opportunities and control variables were included. Table 4 shows a regression model for knowledge of each of the three content areas assessed. As can be seen in Table 4 the effect of completing vocational training and/or a course in economics as a major subject at secondary school on performance on the TEL4-G items (model 1) was highly significant, even when taking into account the control variables. Here, a positive effect on economic knowledge can be assumed for both learning opportunities. On the contrary, attendance of a specialized upper secondary school compared to attendance of a standard upper secondary school shows no significant differences, whereas the coefficient B has a negative sign, which is compatible with the findings of Trautwein et al. (2007). Model 1 explains 14.1% of the total variance (adjusted R2). As reported in other studies (see “Factors that influence the knowledge of economics of beginning university students” section), the male participants with an average of approximately .82 points performed significantly better than female students on the TEL4-G items. The final grade also correlates positively with the scores on the TEL4-G items. A participant with a grade of 1.3 could respond correctly to approximately .72 TEL4-G items more than a participant with a grade of 2.3. The control variable migration background had no significant effect (p = . 906) on the scores on the TEL4-G items. In the regression model 2 for the TUCE4-G items concerning macroeconomics, almost a quarter of the total variance could be explained (adjusted R2 = 24.2). Completing vocational training and a course in economics as a major subject at secondary school also had a highly significant positive effect on knowledge of macroeconomics. Here also, attendance of a specialized upper secondary school has no significant influence compared to attendance of a standard upper secondary school, while the coefficient B again has a negative sign. Generally, participants who had completed vocational training achieved approximately 1.68 points and participants who had completed a course in economics as a major subject at secondary school achieved approximately 1.58 points more than participants who had not had these two learning opportunities. On the TUCE4-G items concerning macroeconomics, male participants scored an average of approximately 2.14 points more than female participants. Similarly, the participants’ grade upon leaving school made a significant contribution to explaining this: On average, participants with a grade of 2 achieved approximately 2.14 points more on the TUCE4-G items concerning macroeconomics than participants with a grade of 3. Migration background is not significant in score on the TUCE4-G items concerning macroeconomics (p = .212). In this study the effects of economic education obtained prior to university studies on beginning students’ knowledge in different content areas of economics were investigated while controlling for additional person-related variables. While the findings for general knowledge of economics, which was assessed using items from the TEL4-G, were in line with the results of previous studies, a different picture emerged for higher-level knowledge of economics, which was assessed using items concerning macroeconomics and microeconomics from the TUCE4-G. Significant differences in knowledge of macroeconomics were found in favor of participants who had completed vocational training or a course in economics as a major subject at secondary school whereas differences in knowledge of microeconomics were only minor and not significant (see results of the t test and the regression model in “Histograms and t-tests” and “Regression models” sections). Completing vocational training or a course in economics as a major subject at secondary school therefore had an effect on general knowledge of economics and knowledge of macroeconomics, but not on knowledge of microeconomics. Attendance of an upper secondary school specializing in economics has no significant effect on neither of the three scores, whereas the coefficient B has a negative sign in all three cases. These findings should be examined critically due to the comparatively small sample resulting from the booklet design of the two content areas of the TUCE4-G. While the descriptive statistics of the sample are to a great extent consistent with official national statistics pertaining to higher education, this study was never designed to be a representative survey; rather the aim of this study was to gain preliminary insights into beginning university students’ knowledge in the three main content areas of economics. Particularly the non-significant scores regarding attendance of a specialized upper secondary school should be critically examined. The suitability of the two instruments for higher education study entry diagnostics in the domain of economics also can be estimated from the findings. Overall, combining items from different test instruments to assess knowledge appears to be advantageous. However, the findings indicate that it is not very target-oriented to use all the items on the TUCE4-G in their available form as a part of study entry diagnostics for beginning students. For example, in the microeconomics part, no participant was able to score more than 20 points out of the maximum score of 30 points. Some of the items from the TUCE4-G are therefore too difficult even for beginning students who have already utilized economic learning opportunities beforehand. Instead, it is more suitable to select items that build directly on the knowledge required for the TEL4-G in terms of content or that is rooted in secondary school curriculum. Therefore, future studies should aim to include a higher number of test items from the TEL4-G in combination with items from the TUCE4-G. The findings of this study indisputably show that during commercial vocational training knowledge is imparted that, according to previous curricular analyses, can be considered study-relevant for economics degree courses and, to some extent, provides students with a foundation for learning about various economics-related topics such as those assessed using the TUCE4-G items concerning macroeconomics. The findings also indicate, however, that beginning students have a limited amount of study-relevant knowledge only. The generally rather low mean values of the scores on TUCE4-G items indicate this as well (see “Histograms and t-tests” section). It would be interesting to use this study as a basis to examine longitudinally whether the generally higher level of knowledge gained by completing vocational training or a course in economics as a major subject at secondary school has a positive influence on knowledge acquisition over the course of higher education studies. With regard to implications for higher education didactics, the findings of this study indicate that there is considerable heterogeneity in terms of knowledge of economics of beginning students in the field of business and economics. Study entry diagnostics of this sort are needed for designing higher education courses that will support beginning students who are disadvantaged due to a lack of prior education in economics (McAlpine and Weston 2000). In the sense of the curriculum-instruction-assessment triad by Pellegrino (2012) such study entry diagnostics provide a basis upon which curricula of economics degree courses can be planned and instructional methods can be chosen in a targeted manner. Although heterogeneity in the classroom is to be expected in degree courses in fields of study as popular as economics, such diversity in study-related knowledge poses a challenge for implementing technically innovative and potentially very effective instructional methods such as individualized learning pearls. Such methods should be tested and further developed so that instructors eventually can use them to provide beginning students with differentiated learning opportunities in the classroom and online regardless of their level of prior education in economics and thereby increase the likelihood of study success (Dimitrova et al. 2003; Oliver 2001). From a didactics perspective, observing which contents posed particular difficulties for the students is an important insight for student-oriented teaching. Overall, as expected, the items from the TEL4-G were more likely to be solved correctly than items from the TUCE4-G. Within the TUCE4-G, the items concerning microeconomics were more difficult for students to solve than macroeconomics-related items (see “Results”). A closer examination of the three test parts (TEL4-G; TUCE4-G macro- and microeconomics) will provide interesting insights regarding the exact areas where participants showed shortcomings. Upon viewing the correct-response rates for items from the TEL4-G, it becomes apparent that particular difficulties occurred in the content areas “money and inflation” and “labor markets and income”. One possible interpretation for this observation would be that these areas have a great overlap with students’ personal finances. Personal finance contents are generally hardly covered in German economics curricula (Retzmann and Seeber 2016, p. 9). In the general education sector, only few references to this content area can be found (Happ et al. 2018; Happ and Förster 2017). First studies show that beginning university students have comparable deficits in their personal financial knowledge (Förster and Happ 2018). It is therefore comprehensible that beginning students have deficits in this area, which can provide an important point for subject-specific didactics. In the macroeconomics part of the TUCE4-G, students had particular difficulties in the content area “monetary and fiscal policies”. Correct-response rates of > 20% per item show that participants have major shortcomings in this area. Participants also struggled with the content area “policy debates”, which seems rather surprising considering that school curricular primarily address economic topics from a political perspective (see “Factors that influence the knowledge of economics of beginning university students”). It is possible, however, that curricular hardly reach the depth required for a profound macroeconomic understanding. Out of the TUCE4-G items on microeconomics, the lowest correct-response rates were observed in items from two content areas, “markets and prices8” and “theories of firm9”, where the correct-response rate lies below 20% per item for all items. This reveals substantial deficits in students’ microeconomic knowledge and understanding. These finding clearly show that an in-depth macro- and microeconomic understanding can not be expected from any of the participants (irrespective of whether they completed an economics course as a major subject or a vocational training). According to the German Centre for Higher Education Research and Science Studies the proportion of new students enrolled who had obtained pre-study vocational training was 22% in the winter term 2011/2012 (Scheller et al. 2013). Besides upper secondary schools focussing on economics, there are also schools specializing in technology and engineering and health and social matters (for Rhineland-Palatinate, see Ministry for Education 2017). At the same time, for copyright reasons, not all instruments are freely accessible, which inhibited their full use for the present study. After consultation with the test developers, a decision was made against creating short versions of the two TUCE versions as there would be no guarantee for maintaining the quality standards (such as scale reliability and validity of test score interpretations). The reliability when using the TUCE in the present study has a Cronbach’s alpha of .64 (TUCE4-G macroeconomics) and .58 (TUCE4-G microeconomics). As later findings show, the TUCE4-G can be considered rather difficult for participants in their first semester. In order to cover the expected range of economic knowledge at the beginning of studies, the present study used both the TUCE4-G and the TEL4-G.
All analyses presented in the paper were conducted using the software SPSS Version 23 (IBM Corp 2014). Values of Cohen’s d effect size can be tiny (d < .3), small (d < .5), medium (from d > .5 to d < .8) or large (d > .8) (see Cohen 1988). Models with interaction effects between the learning opportunities were also calculated (Aiken and West 1996; Fox 2008). However, based on the 5% significance level, these show no significant effects and are therefore disregarded hereafter. Similarly, the interaction effect models showed a lower adjusted R-squared, which implies a worse model specification in these models. This covers contents such as “determinants of supply and demand”, “utility”, “elasticity”, “price ceilings and floors” (Walstad and Rebeck 2008). This content area includes, among others “revenues”, “costs”, “marginal analysis” and “market structures” (Walstad and Rebeck 2008). All authors contributed substantially to this work. RH and OZ-T developed the theoretical framework of the paper. Data analysis for this paper was conducted by MF and RH. All authors discussed the manuscript at all stages. All authors read and approved the final manuscript. Not applicable. There is a copyright on the test instruments by the Council for Economic Education (CEE; US) and the data set cannot be shared. Taking part in the research project was entirely voluntary. All students consented to participate. A ethic committee was established at the end of 2014 at the department of business and economics at the University in Mainz. Until that point the design and the questionnaire was finished. If the editors wish a retrospective ethics approval of the anonymous, voluntary study, we can ask the ethics committee. We have still talked to a member of the ethics committee and he remarked no critical points in the questionnaire.